This British import tells the story of Morris, a thoroughly spoiled boy who demands larger and larger presents from his adoring parents over the 12 days of Christmas. 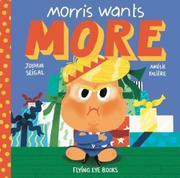 Morris has blond hair that swoops down over his forehead, distinctly orange skin, and rather chubby cheeks and tummy. He wears a dark blue suit, a red tie, and a perpetually petulant look. Morris also sports a red crown, and his indulgent parents call him “sweet prince,” though there is nothing at all sweet about Morris. His parents (who have pink cheeks rather than orange) give him just a tiny package on the first day of Christmas, but Morris rejects their gift. He demands larger and larger gifts on the following days, with adjectives ranging from “huge” to “gargantuan,” and the 12th takes up the entire double-page spread, flattening Morris. In a deadpan conclusion, his parents lead him away, perhaps none the wiser as to the effects of his unmitigated greed. Cartoon-style illustrations in bright colors use simple shapes standing out against white backgrounds, with each numbered present wrapped in paper of a different pattern. Young readers will see this as a story about a spoiled child who is crushed by his excessive demands; adult readers will recognize the similarities between Morris and President Trump and the underlying political commentary.